Comicave and Kotobukiya brings you another Batman like you've never seen him before with the BATMAN v SUPERMAN: DAWN OF JUSTICE Batman ARTFX+ Statue. Batman blocks with his left arm, raising his right as he readies a punch, all while wearing an armored battle suit. Highly detailed sculpt brings Batman to life, all the way down to the gritty georama base and the fabric patterns in Batman's cape, all in a 1/10 scale perfect for display. 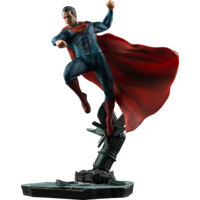 Comicave and Kotobukiya brings you another Batman like you've never seen him before with the BATMAN v SUPERMAN: DAWN OF JUSTICE Batman ARTFX+ Statue. Batman blocks with his left arm, raising his right as he readies a punch, all while wearing an armored battle suit. 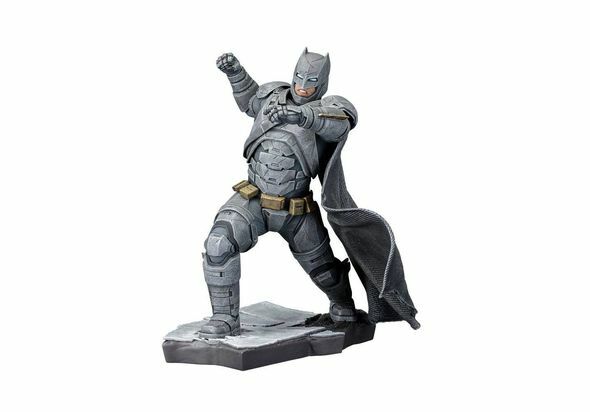 Highly detailed sculpt brings Batman to life, all the way down to the gritty georama base and the fabric patterns in Batman's cape, all in a 1/10 scale perfect for display.